When deciding where your furniture should go check the direction of any sunlight as this will fade or discolour any material. It can also warp and crack wood or dry out leather. As with direct sunlight placing your furniture next to radiators, fires or other heat sources can cause damage as the wood dries out. If you decide to move your furniture, having checked sunlight and heat in the place you want to move the piece to, make sure you lift your furniture as dragging it will loosen any joints not to mention damaging your floor. If you have wood floors then the felt pads you stick to the feet of furniture are a great way of ensuring your floor doesn’t get damaged. Any excess liquid on furniture will soak in and damage it. Always blot up any spills starting at the outside of the spill and working in. Don’t wipe as this will spread the spillage and make it soak in. Clean / Treat the wood with bees wax polish and buff with a soft clothevery so often. To keep your wood furniture looking its best an occasional polish and buff with a bees wax polish and a soft cloth is all that is needed. Silicone polishes can damage the finish of the furniture. We recommend the use of Wood Silk Non Silicone Furniture Polish for polishing furniture. As direct sunlight fades and discolours the finish anything sat on top that stops the light will mean there is a spot of the original colour where it has been. To avoid this leave the surface empty for the first few weeks and then move any ornaments to keep an even colour. Anything hot put on a wood surface will damage the finish. The best way to deal with this is use mats or coasters to prevent the damage. As a natural product wood will move and change in different temperatures and humidity. This will make drawers occasionally a bit sticky. 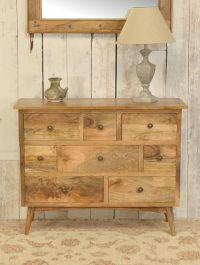 To correct this use a wax candle or bar of soap and rub it on the drawer runners or drawer edges. Turn or swap cushions to ensure an even wear. Where a chair or sofa has cushions these should be plumped regularly and turned to keep them looking their best. If the seat has more than one cushion it is a good idea to swap these round once in a while to ensure even wear. Running your vacuum with the soft brush attachment fitted over your seating will help keep the dust and dirt to a minimum. Taking the time to regularly rub a good quality leather furniture polish into your leather furniture will keep the leather in good condition. 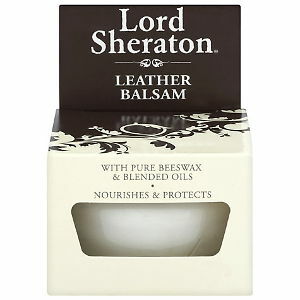 We recommend the use of Lord Sheraton Leather Balsam, on the first use try the polish in a discrete area to check for any colour change.